Mr. Richard G. Kyle is Group President at The Timken Company. He graduated from Purdue with a bachelor’s degree in mechanical engineering in 1988 and earned a master’s degree in management from Northwestern University’s J.L. Kellogg Graduate School of Management. Named to the position in 2012, Mr. Kyle is responsible for the company’s Aerospace & Defense and Steel business segments. He also has corporate-wide responsibilities for the enterprise’s innovation, engineering, and technology efforts. The Aerospace & Defense segment includes the company’s global commercial and military aviation and aerospace businesses as well as the health and position control business. The Steel Business leverages the company’s application knowledge to develop solutions that consistently improve product durability and ownership costs. The segment provides the broadest portfolio of specialty steel products to meet customers’ specific needs and exacting standards. Prior to being named to his current role, Mr. Kyle served as President of the Aerospace & Defense and Mobile Industries segments. He led Mobile Industries through significant changes in product portfolio, market mix and operating capabilities that yielded dramatic improvements in the financial performance of the segment. For two years, beginning in 2007, he served as Vice President of Manufacturing for the Mobile Industries segment. He also managed the Bearings and Power Transmission Group’s global manufacturing operations. 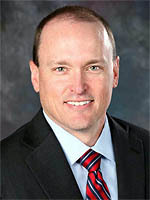 Mr. Kyle joined Timken in 2007 as Vice President of Manufacturing for the company’s former Industrial Group. Previously, he served as Vice President of Operations for a division of Hubbell, Inc., and in management positions with Cooper Industries. Mr. Kyle serves on the board of directors of the United Way of Greater Stark County.